Downtown Ann Arbor is the subtext for many of the intense debates about our city’s future. In part this is because of its role in defining both the image and the life of the city. In part it is because of its proximity to the main University of Michigan campus and the strong student presence that results. And in part it is because there is money to made by exploiting the very concept of Downtown. This has meant that much recent conflict has been over the attempt to expand the limits of downtown, both in concept and in real ways, like denser development outside downtown’s currently planned borders (which are essentially the Downtown Development Authority’s district border). Thus the debate over Heritage Row (proposed for a residential neighborhood in a near-downtown area) has had many online commenters calling that area downtown. A similar effect has been seen with the Near North development, where several houses in a near-downtown residential neighborhood are to be razed, with a substantial contribution from the DDA (though the location is outside their district). Many people, especially those in their 20s and 30s, who would like to find decent, affordable (in the general sense) housing near the downtown and campus, have been resentful at what they see as an artificial distinction, while near-downtown residents feel embattled (see our early post on these two neighborhoods). Downtown, the experience of life or leisure there, and its cachet are a limited resource that we are trying to sort out among ourselves. It is partly a realm of the imagination and it is also a sum of gritty decisions and choices. Some of the most difficult of these involve parking. Whether a visitor, a downtown worker, or a resident, we all want easy access to downtown and easy walkability to our destination. That is one reason that near-downtown neighborhoods are so appealing; one can simply walk downtown. The DDA has been managing parking in the downtown since the early 1990s, and doing a very fine job of it, too. (See discussion of parking on the DDA website.) Unfortunately, this has also led the DDA into a thorny thicket where many competing interests are vying for this precious resource. It also has led to demands from the City Council for a big share of the parking revenue (as reported by the Ann Arbor Chronicle). This week’s DDA committee meetings had several examples of the interaction of downtown’s future and the parking question. Its Economic Development and Communication committee hosted Mary Kerr, President of the Ann Arbor Convention and Visitor’s Bureau and Jennifer Owens, Vice President of Business Development, SPARK. The committee is trying to establish the DDA’s place in the local ecosystem for marketing Ann Arbor and especially its downtown. Their question to both could be paraphrased as: how do you see the importance of the downtown in your work, and what should happen to make the downtown even more attractive from an economic development standpoint? Kerr’s answer was that tourists and conventioneers love Ann Arbor’s downtown, and it forms an important part of their impression of the community. (She repeated this several times, with variations.) But she mentioned that they would like to be able to walk from their hotel into the downtown (currently most hotels are at the outskirts). She said that parking was not a complaint for most. Yet clearly from her comments, the easy access to downtown was an important part of the experience. Owens, on the other hand, said that parking was a major impediment to having businesses locate downtown. Potential business owners are frustrated with the lack of easily accessible parking spots. They expect to pay for them, of course, but those monthly permits (generally awarded on an annual basis; there is a waiting list for most structures) are hard to come by. As I explained in a 2006 article published by the Ann Arbor Observer, parking permits do not really pay their freight. The charges for these permits are supported by hourly parkers, and by the growth in the system, which is nearly nil. (As we explained in a recent post, the costly payments for the roughly $50 million underground parking structure near the library are now being picked up by the tax increment financing; an indication that the parking system is no longer paying for itself.) The DDA has tried over the years to minimize the number of downtown workers actually demanding downtown parking. It has been a leader in promoting “alternative” [i.e., nonauto] transportation to and around the downtown and is now the main supporter of getDowntown, which provides almost free bus passes and promotes bicycling and walking. But Owens was very clear that the high-tech companies who SPARK is wooing wanted parking, not mass transit. “These are people who earn very high incomes. They are not going to take the bus.” Her message to DDA was simple. If you want to bring more businesses downtown, it is parking, parking, parking. So in a sense, what defines downtown is: anywhere within walking distance, especially if you can leave your car there. 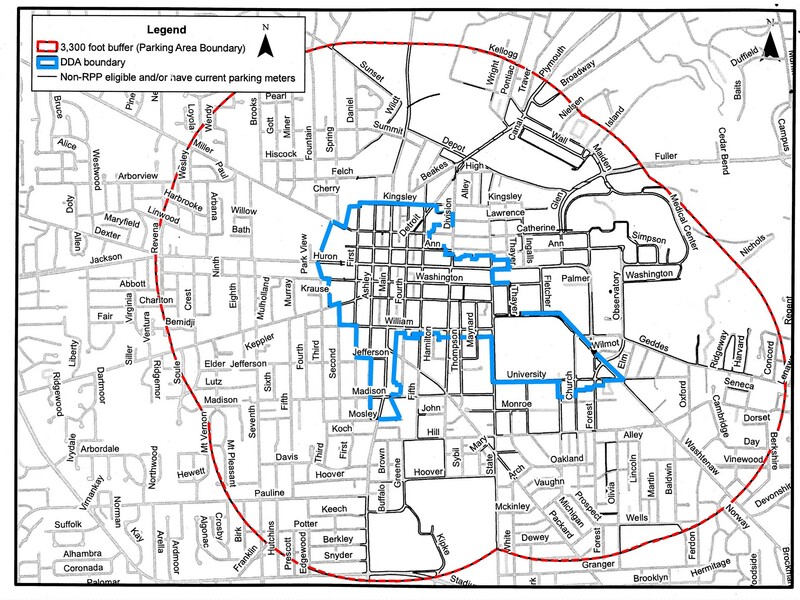 At the DDA’s Bricks and Money committee meeting, staff member Amber Miller presented her parking district study that would, in its broadest application, put anywhere in Ann Arbor that is within walking distance under the “parking management” of the DDA. Miller, who is a recent graduate of the UM urban planning program, argued hard for her more expansive view (see the explanation and excellent graphics by the Ann Arbor Chronicle). This would draw a 3,300 foot “buffer” around the downtown, reaching far into residential neighborhoods. (I was startled to see that my house, 2 miles from State Street and thus just walkable, was just inside the boundary.) In her concept, all of this area was possible parking for downtown and thus a reasonable area for the DDA to manage. Miller also called out streets (not visible in this reproduction but called out in the Chronicle’s account, and colored purple in the projection shown at the meeting) that qualified under more restrictive criteria, including a nonresidential use for some parcels and not eligible for the Residential Parking Permit program. Committee members were reluctant to endorse the more expansive boundary, or even all the more distant and more obviously residential streets that qualified under the more restrictive guidelines. Roger Hewitt warned of a political firestorm. He said that putting streets like Sunset Road, for example, under the DDA management, would cause political problems that wouldn’t be warranted. The consensus of the committee seemed to be to offer to manage the “purple streets”, but maybe not even all of them. Miller, chagrined, pointed out that “land uses might change” (striking fear in this neighborhood advocate’s heart), but wiser heads apparently prevailed. Pollay also hastened to point out that the DDA would not necessarily plan to put parking meters on all streets under its management. Regardless of the outcome of this immediate plan, it is clear that not just the neighborhoods immediately adjacent to downtown but also all those within any reasonable walking distance are not being regarded as excluded by all those plan boundaries (Downtown Plan, Calthorpe Plan, etc.) but are gradually being withdrawn into the economic entity that is Ann Arbor’s Downtown. There will be many more debates to come. Postscript: Owens told an amusing story about bringing representatives from a Santa Barbara company to Ann Arbor in July. They were charmed. Wonder how much parking opportunity will be necessary to retain that charm during Ann Arbor’s winter? This entry was posted on February 25, 2011 at 10:22 pm and is filed under Business, Neighborhoods. You can subscribe via RSS 2.0 feed to this post's comments. You can comment below, or link to this permanent URL from your own site. Love this plan, because it might finally engage a broader community in the Ruling Class’s apparent death-by-a-thousand-cuts plans for the city. Per your observations, this seems to be the one thing most feared by The Ruling Class. Re-watching Ken Burns’ National Parks documentary, note his comments on the early attempts to commercialize the beauty out of places like Yosemite and the Grand Canyon. Commercializing the charm out of Ann Arbor appears to be the plan of the Ruling Class. If such commercialization came out of a full and frank public discussion, I could have a measure of peace with it. When it comes from people who deny that this their plan, and deny that they are currently implementing it, I have more difficulty being at peace with it. Just as the attempt to keep a lid on public engagement has led to the lid being blown off in the Middle East, with its likely baby-with-the-bath water consequences, so sooner or later will the present dissembling and attempts to shut out the public from discussion of Ann Arbor’s future eventually lead to a local political explosion, with some attendant over-the-topness. Much better to have a current, open discussion of the issues of the day, on their merits. In dismissing the possibility that tech workers would ever consider riding public transit, SPARK’s Owens is curiously out of touch with 21st-century norms. On the contrary, the young talent that tech businesses seek to recruit want to live in places distinguished by abundant transit options, not abundant parking. I’ve heard that some local firms have had trouble recruiting workers here for precisely that reason. Yes, your point is good. However, I suspect that she was actually speaking of the owners and managers of the companies, not their young workers. She deals mostly with the top brass. Two things jumped out at me during a quick read–that the execs can afford to live in the empty downtown penthouses and condos; and that we do need diverse transportation options to reduce the resistance to using them. Having a range of ages downtown is very important to keeping the civic environment lively and livable. Why? Because certain developers, along with some council and DDA members, and their friends on the public policy board of the Chamber of Commerce (some of the same names, by the way), decided that downtown was no longer the traditional area identified in the master plans, zoning, and DDA charter, but an area much larger. This new development frontier included neighborhoods where land was less expensive than the proper downtown. Instead of working within the designated target zones for high residential density (newly coined D1 and D2 after 8 years of study and consideration) these folks wanted to immediately begin the urban sprawl cycle all over again from the center. We can no longer say we live downtown, because to do so leaves us vulnerable to claims that our neighborhood should be treated like downtown–with parking meters, inappropriate Motel 6-like apartment buildings, and the DDA posting signs declaring us “downtown,” and even wanting to dictate what art will go into our neighborhood park. Having a healthy mix of population concentrated in or near downtown means providing a variety of housing options—not just high rises or six-bedroom student tenements. Our traditional, one-house one-lot neighborhood is one such option. Many of the houses are divided into multiple apartments, but many are not.. Some are in wonderful shape, and some have seen better days. Universally, the people that live here like the short walks to downtown, the transit center, church, and Campus. They like the sidewalks, yards, porches and trees. They like the hustle and bustle of a dense neighborhood near business and education nodes, but they also like the quiet evening strolls, the dogs, and the neighbors that say hello. Good urban planning takes classroom theories and applies them to the real world where buildings, roads, and parks already exist, and where people already live, work, worship, shop, eat, etc. Well-functioning neighborhoods that ain’t broke, shouldn’t be fixed, but preserved, supported and expanded. Likewise, transportation planning needs to consider what already exists and works. Bike lanes, quality roads and sidewalks, and efficient traffic signals should be fairly simple things to provide just by improving or maintaining what we already have. Our bus system is well equipped, but maybe could be improved in terms of certain service areas. I think we miss the mark in our humble little college town however, when we start spending millions on parking structures, commuter trains, and other huge and heavily subsidized capital projects without data showing any known demand for them. For example, if someone could show me a critical mass of workers living in Howell and Brighton, working in Ann Arbor, who would be willing to ride and pay for commuter train service, then maybe I could get behind WALLY. If someone showed me that there were enough hospital workers living in Dearborn and Ypsilanti to support a train to and from UM hospital, then I might get excited. At meetings about trains, all I hear from proponents are anecdotal remarks, and mass transit theories spouted by individuals who sound more like evangelists, than researchers, thinkers or planners. They remind me of college freshmen who take Psych 101 and then believe they’re qualified to analyze their families over Christmas break. Since there are many square miles of inexpensive, vacant farmland all around Ann Arbor, building trains out to rural villages will only encourage more sprawl. Already I’ve heard of speculators buying up farmland in Whitmore Lake on the gamble that a train station will go there someday. I enjoy traveling to London, Washington D.C., Chicago, New York, and other big cities with trains and subways. But these places need them because they are very large cities, with dense populations spread over many square miles. Ann Arbor is not large and not dense. I’m looking forward to seeing the 2010 census data. Estimates are that our population has shrunk somewhat over the past 10 years. That would fit with the overall trend for the past 40 years where the population has averaged no more than .5% growth per year. Others may see that as a failure, but not me. Our city can prosper in a contained and sustainable (self-sustaining) way by focusing on quality, durability, support for local businesses and farms, preservation of existing resources, and support for the things that work—you know, things like my neighborhood. You won’t stop sprawl by building trains out into the sticks, but you might slow it dramatically by making the city—downtown and nearby—more desirable places to live. Very well said! Not much I can add. I was looking for Ann Arbor Apartments Downtown and came across your site. This is going to be very helpful in my search. Thank you!